Richard Scott Proehl was born March 7, 1968 in the Bronx and grew up in Hillsborough Township. Quick and coordinated, Ricky was a standout in the town’s youth sports leagues and later was the best player on the Hillsborough High baseball and football teams. As a senior, Ricky reeled in 42 passes for coach Joe Paulino’s Raiders and averaged more than 20 yards per catch. He was named Somerset County Player of the Year and earned All-State recognition. The Raiders were conference champions in 1985. Among the colleges that coveted Ricky’s great hands and route-running talents was Wake Forest. Coach Al Groh, a native New Yorker and longtime friend of Giants coach Bill Parcells, successfully recruited Ricky to the Demon Deacons program, and he lettered as a freshman. Groh was replaced the following year by Greg Dooley and Wake turned in two winning seasons before falling to 2–8–1 in Ricky’s senior year. Ricky graduated with school records for 2,949 receiving yards and 25 receiving touchdowns. He had 50-plus catches as a sophomore, junior and senior, and topped 1,000 yards in his final season, when he earned All-America recognition. He was All-ACC as a junior and senior. In 1990, the Phoenix Cardinals took Ricky in the third round of the NFL Draft. It turned out to be a great draft for the club at the running back position. They took Larry Centers in the 5th round and Johnny Johnson in the 7th. Both went on to have Pro Bowl seasons. As for Ricky, he broke the team record for receptions by a rookie with 56, becoming the first rookie in 40 years to lead the Cards in catches. In his five years with the Cardinals, Ricky was good for 50 to 65 catches a season and scored a total of 21 touchdowns. Ricky was never his team’s go-to wideout, but was prized for his sure hands and clutch plays. After playing briefly for the Seahawks and Bears, he ended up in a great situation when he signed with the Rams in 1998 at the age of 30. He played third banana to Isaac Bruce and Torry Holt in the Kurt Warner-led passing attack dubbed the “Greatest Show on Turf.” The Rams won 13 games in 1999 and beat the Titans in the Super Bowl. Ricky caught a first-quarter pass for a first down. It was his 8th catch of the postseason. Six had come against the Bucs in the NFC title game—including the amazing one-handed game-winning TD with under 5 minutes to play. 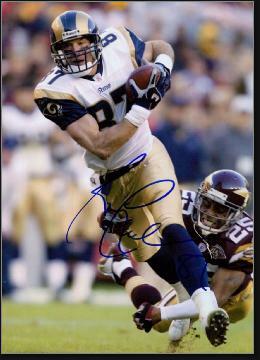 The Rams returned to the Super Bowl two years later and Ricky caught the game-tying pass with 1:30 to play. The Patriots won the game on an Adam Vinatieri field goal. Ricky played three more years for the Rams and then finished his career with the Carolina Panthers and Indianapolis Colts in 2006. He played in one more Super Bowl, this time with Carolina, and again caught a clutch game-tying pass with under 2 minutes to go. Once again, Adam Vinatieri undid his heroics with a game-winning field goal. The two ended up as teammates on the Colts in 2006. Indianapolis won the Super Bowl that year although Ricky was not on the roster for the game. In 17 NFL seasons, Ricky caught 669 passes for 8,878 yards and 54 touchdowns. He became a broadcaster and receivers coach after his playing days.